In the short timeframe Nintendo Switch has existed, Bethesda has shown an incredible amount of support for the system. It’s already brought across two of its most iconic franchises in the first year, with another one – Wolfenstein II: The New Colossus – expected to arrive in 2018. 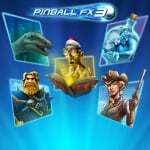 If you’re eagerly anticipating that next hit of sweet Bethesda gaming, perhaps Pinball FX3 can tide you over until then – with Zen Studios recently releasing a trio of action-packed Bethesda-themed tables in a single bundle. Having tested out all three, here is an overview including our thoughts. Firstly, until there’s an official announcement (fingers crossed), this is as close as you’ll get to a Fallout game on Switch. What’s on offer within this specific table depicts the source material as accurately as it possibly can while adhering to the limitations and laws of the pinball universe. All the notable elements of the Fallout series are present. While the role-playing mechanics in place under these conditions are not as deep or intricate as the actual games, you are still able to create and customise a 3D animated character, join factions, find loot, raid vaults and collect bobbleheads while gunning down super mutants and launching the famous mini-nuke – the Fat Boy. The V.A.T.S system is also present – giving your character an edge in battle with precision shots on the playfield – and there plenty of table events that can earn you a higher score. Each session you play on this table begins with the character creation. You can opt for a randomly generated one, or be more precise – selecting a gender and then assigning skill points as well as seven special attributes. Sound familiar? At the beginning of each game, you’ll also receive a companion with bonus perks to join you on your pinball journey. The role-playing game elements become more apparent the more you play. There’s a shop where you can spend bottle caps at – allowing you to treat your character’s radiation poising or wounds, improve any armour and weapons you have and become more powerful. You can level-up by completing quests, just like you would in Fallout, and gain experience – with skill points provided as a reward and used to buy attributes. These attributes raise the usual stats like perception, sneaking abilities along with strength and melee damage. Fights take any decisions or specialisations into account. During a fight, if the character’s health bar reaches zero, it is game over. Radiation poisoning is also a constant threat. The faction system mimics the game as best as it possibly can, with the ability to join one of four groups – the Minutemen, the Railroad, the Brotherhood of Steel and the Institute. Quests for each one can be activated by targeting specific areas on the table, including bumpers or ramps and the tasks will again typically be to hit certain areas on the table. Each faction comes with bonuses effects like extra balls or an enhanced ball-saver duration and has five quests each. Once all the quests have been completed in a faction, your character then sides with that group and is given the chance to attack any rival factions. In addition to this are vault quests, allowing you to collect bobbleheads sporting special perks and eventually unlocking the Wizard mode. As enemies are able to pop-up on the table at any time, you’ll find yourself in fighting on a regular basis – with each battle broken down into attacking and defending phases. The aesthetic presentation of this table captures the nuclear wastelands of Fallout perfectly. The table itself resembles a pile of functional junk. As deceiving as it may seem, there's still plenty of secrets to discover about the table. Character comments about Nuka-Cola will also make any Fallout veteran feel right at home. The minute you launch this table, you’ll know it's based on DOOM because a chainsaw is somehow launching a ball into the playing field. On a related note, the visual design of this particular table is astounding, right down to the scoreboard and menus – featuring pixel graphics from the classic DOOM games. Before you do dive into the pinball equivalent of hell, you’ll be required to select a difficulty. Channeling the game, the differences between the 'Hurt Me Plenty' and 'Nightmare' settings here are that the table’s support features are either enabled or disabled. This includes the usual pinball bonuses like extra balls, kickbacks and ball saves. The difficulty setting you select is obviously dependent on your own skills and it is both fun and challenging to set high scores with no assists. Like other tables, key landmarks on this one will activate different sequences including missions. 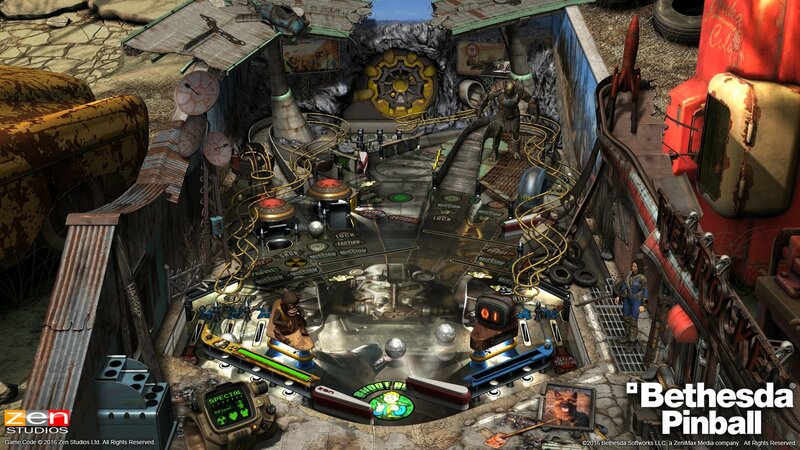 Generally, you’ll be required to power-up generators to turn the lights back on in the facility – pinball style, by hitting bumpers or the spinner repeatedly, while visiting points of interest including “the pit” and the labs. You’ll also be closing portals and fighting off hoards of demons on a regular basis, not to mention taking on a formidable Cyberdemon. Survival is just as relevant here as it is in the game. If your health meter is emptied, you’ll have to start again. Completion of a mission will reward you with Argent Cells which in return give you health, armour and ammo upgrades – again, this mirrors the source material. Additional side modes within the table remove some predictability from the play – with the chance to travel to hell and back to further increase your score. Like the recent DOOM game, there are also hologram devices that have information about events from the past and provide ways of progression. When translated to a table, this requires you to target a specific area or pathway on the playing field in order to earn a higher score. Of course, the weapons are always an exhilarating part of the DOOM games, and this table attempts to recreate the magic by incorporating the gunplay with the pinball action. Your character starts off with a pistol, and can upgrade to bigger and better weapons including shotguns, rocket launchers and even chainsaws by hitting a captive ball in the middle of the table. Slaughtering demons is an on-going requirement and you’re rewarded with health, ammo and armour – and a higher score. You can also heal-up and replenish supplies by hitting certain parts of the board. 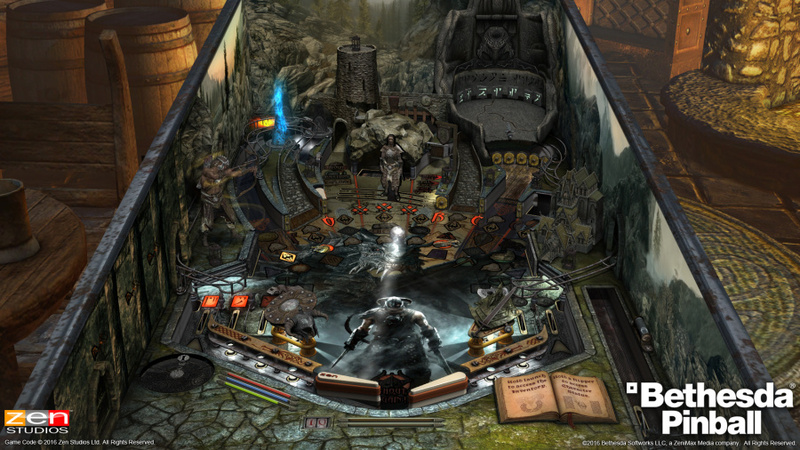 Other elements of DOOM – like Rune trials – have been incorporated and even the Deathmatch mode gets referenced as a multiball. Attempting to recreate DOOM as a pinball table is definitely gutsy. However, it seems to work. The intense metal music playing in the background along with prolonged moments of eerie space station silence then followed by the cries of demons and the roar of a chainsaw adds to the immersion. It’s all of these elements combined that aim to provide you with a similar adrenaline rush you get from playing the actual DOOM games, and will spur you on to perform at your highest level. There’s also more flow to this table and the level of challenge of offer feels fitting. 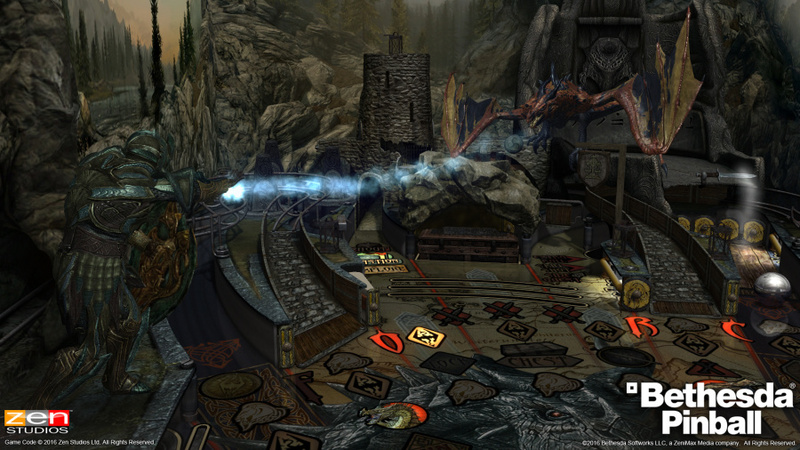 Zen Studios has achieved the impossible, down-scaling The Elder Scrolls V: Skyrim – a game of grand proportions – to a single pinball table. This table is more in line with Fallout than the DOOM one – with the ability to customise your character’s race, abilities, armour and weapons, join factions and guilds, take on quests, fight a variety of dragons, visit shops and level-up. On paper it might seem impossible to recreate this type of role-playing game on a pinball table, but somehow they’ve done it. Like the game itself, Alduin the dragon is destroying the lands and it’s up to you to defeat him, as you are Dragonborn – a mortal with the soul and power of a dragon. Your character has three bars sustaining each play session – health, magicka and stamina that regenerates – as you take on a range of enemies such as bandits and wolves by targeting them in the middle of the playfield. The depth on this table attempts to match the game – with melee and magic attacks depleting each meter. There are also other complex Skyrim stats included such as weight and how worn your apparel is – staying true to the source. To recreate a sense of adventure, there are multiple quests to complete while travelling to towns and various other locations on the table. To explore each location further, you must hit a ball directly into the watchtower landmark. At certain spots, you’ll discover treasure, chests, enemies and mining sites – all of which develop your character and their adventure. Two distinctive features on this table include the caves and Elder Scroll’s trademark lock picking mechanic. 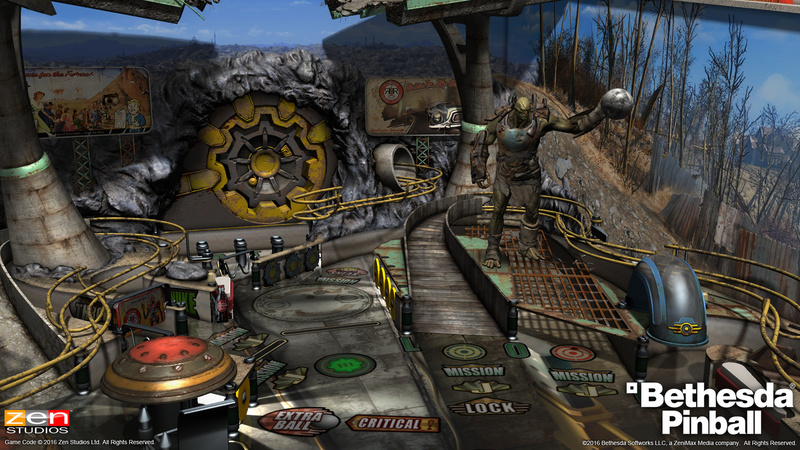 The caves that can be explored and are accessed by fulfilling certain tasks on the table, take on the form of a mini tilt table – where you must navigate a maze to find treasure The lock picking game uses the flipper buttons and if you are successful you’ll be able to access the contents inside a chest. The inns also provide side-quests and enable you to rest at any time of the day, and the guilds and factions will multiply different scores on the table. There are even trainers who will improve your abilities – provided you can target the right area on the table. With dragons flying over the table regularly and plenty of menus to navigate, this table shouldn't surprise anyone who has played Skyrim before. It might be a little slower-paced than the average Pinball FX experience, but it does a great job at capturing the essence of the game it is based on. 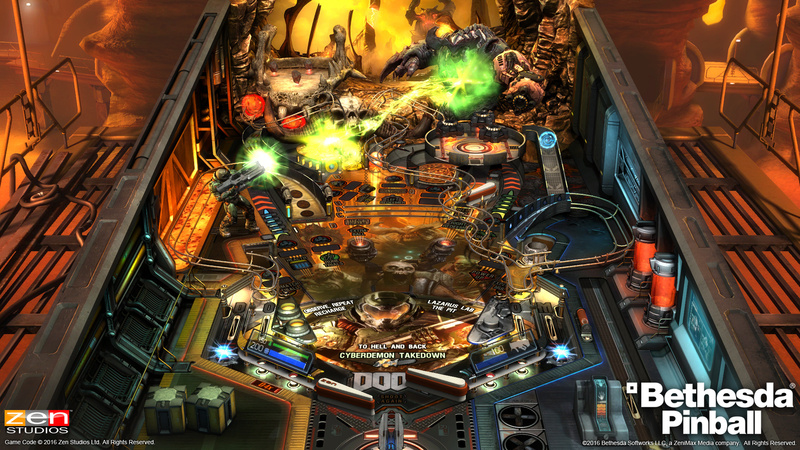 The Bethesda tables manage to standout from existing offerings in Pinball FX3 by providing a unique combination of pinball, extensive role-playing mechanics and interesting challenges. Zen Studios has done a great job with each of the franchises as well, showing full respect to the source material and a certain level of appreciation and care that not every other developer would when handling someone else’s IP. The pacing, rhythm and flow of these tables is one aspect that not everyone might agree with. Sometimes sessions fail to gain momentum because of the role-playing elements. In saying this, what this does do is honour certain Bethesda titles where you may have spent more time navigating inventories or creating characters than actually playing other parts of the game. The overall production values add to the experience, with each table matching the tone of each title by including notable sound effects, voice-overs, music, familiar artwork and 3D models. So if you’re a Pinball FX3 player and happen to like Bethesda games, this is definitely worth a look. Planning on getting these sometime soon. It looks fantastic, and I miss Pinball in general. They all look great! I really dig the Fallout one. I may just have to DL these. Got these a few weeks ago- they are awesome. Actually, I had them already on my Xbone, but I really never play it, so playing these on the Switch was like playing them from scratch again. Anyway of the expansion packs, these are the coolest by far. Once the portable 60fps update kicks in, I will throw a lot of money to them. No doubts about it. Until then, though, I'll play other stuff. I got this as my first dlc. The rpg elements as mentioned above, can be confusing honestly, tho you can still pretty happily play these tables without focusing too much on that. The Doom table is much more straight-forward. At any rate, Ive enjoyed these tables and will probably try some of the others as well. What way do these games work, do you buy individual tables? I don't really have any interest in pinball but I'm enjoying DOOM on Switch so much I'd actually be tempted to check this out. @MartyFlanMJFan Yes you basically buy packs of tables. The Bethesda pack has the Doom/Skyrim/Fallout tables in a pack for 11$usd. I am always in awwww at pinball pros that can trigger all the side missions... I am not that skilled... but I love the challenge they represent! Every time I start a mission... I get so excited that I lose my ball! LOL. @HAL9000 Hah, no kidding, Im not very good at it either, but Im working on it, and it's still fun. Waiting for the update for FX3 then I’ll be investing in these and the other movie related tables. For now I am happily playing the freebies. Definitely my next pack to pick up; absolutely cannot wait for the 60fps update. This is like when Zen took their sweet time updating the iOS version to support the taller screen dimensions of the iPhone 5. When they finally did it, THAT was my favorite day of owning that device. This will be my favorite day of owning the Switch (well not really, too many happy days as it is!)! Zen... please please please follow through with that (twice) promised patch... and please let it actually fix all of the tables. I love the Skyrim and doom tables! Damn I want Fallout for the Switch so hard!!! I always wanted to own a pinball machine. I got a pinball machine and let me tell you... boy are they annoying to service, maintenance, cannot be played quietly... ended up selling it. 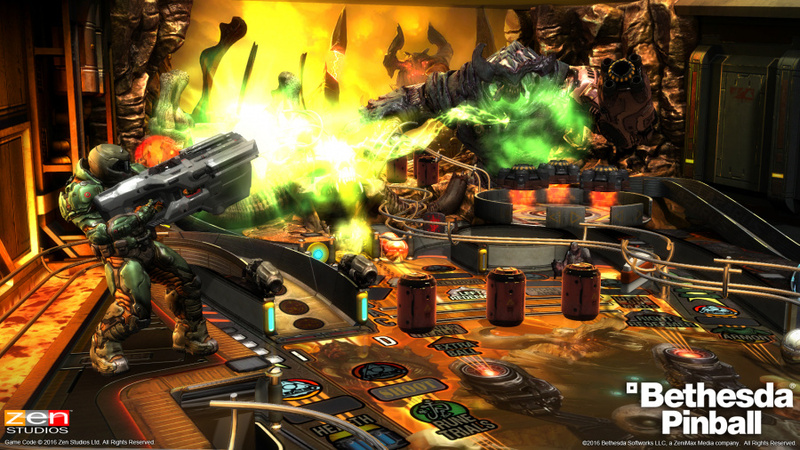 These digital pinball machines by pinball FX are fantastic looking even on a big 4K telly. No regrets. I only want the DOOM table, so the price is quite high considering that I'm only interested in a specific table. Same applies to the Bob's Burgers table. I completely detest MacFarlane's shows so I would rather not have them contaminate my Switch. If they had at least thrown in a Simpsons and/or King of the Hill table, It would have been a better value proposition. @sillygostly I agree with you as far as Family Guy...burned out in that show many years ago. The others in the pack are pretty good and even FG table is sort of entertaining. .. This is like the Reese's Cup of electronic games, putting your RPG in my pinball table, and I love the idea. One of my evergreen favorite games on the 3DS is Metroid Prime Pinball. It's incredibly fun to pick up and waste fifteen or twenty minutes trying to beat your high score or hit all the bonuses. I'm hoping the Bethesda tables have that same vibe. Definitely going to buy this. It can't hurt to send Bethesda the message that Switch players are interested in Fallout, either. I was so excited when I saw power armor. I thought Fallout might finally come to Nintendo. @MartyFlanMJFan I will add that if you like Doom you will love the pinball table of it. All the sounds are there and I can't stop playing that table. For those that enjoy pinball join #HynaGang tournaments. fallout 4 for switch confirmed?? I got these tables as soon as they are released. Pinball FX3 is one of my favorite things on my Switch...period. I have the freebie tables, bought the classics pack 1...the Jurassic Park pack (one of my favorite movie series of all time)...and these Bethesda tables. They are all amazing. The detail in them is simply incredible. I just wish they had carried over the character save feature from the Skyrim table to the Fallout table, rather than make you start with a new character every time you play it. And that Skyrim table...oh man do I love it so much! Being able to create a Skyrim pinball character...and carry it over game after game...trying to work missions and find armor and such (and having your 3D modeled character actually standing on the left side of the table with whatever armor/weapon you currently have equipped) is such fun! Not that I'm really any good at it...but its still amazing fun just the same. Same goes for the other two tables, although I prefer the Doom table over Fallout. All of the sound effects...musics...voice overs...combat...action...etc...in all of these games are soundly replicated in Pinball form. I can't wait to see what they are able to come up with tables next! Echoing what others have said - the Bethesda tables are all great. I put many hours into Zen Pinball 2 on Wii U and 3DS, and Pinball FX3 is a great successor. Hopefully we get the Star Wars tables sometime soon as well. Cue grognard grumbling that TES is the only original Bethesda franchise here. Have yet to play actual doom and skyrim despite owning both (damn you adult life!) but quite enjoyed the free fx3 tables so will deffo get this once I've played those. I LOVE the Doom pinball table. So much fun to go from slaying demons in Doom game to relaxing with Doom pinball. LOL! I want to strangle that darn dragon in Skyrimm table for blocking my view!! I swear that lazy lizard is doing it on purpose! I hope the Fallout table is meant to guage interest in the game (namesake) for the switch. I believe it would still well.